Builth Wells (/ˈbɪlθ ˈwɛlz/; Welsh: Llanfair ym Muallt) is a town and community in the county of Powys, within the historic boundaries of Brecknockshire (Breconshire), mid Wales, lying at the confluence of the River Wye and the River Irfon, in the Welsh (or Upper) section of the Wye Valley. It has a population of 2,568. Builth first emerged in post-Roman times, probably on the other side of the Irfon river from its present site at Dol Eglwys (Church Mound) where a ruined early medieval church is thought to have stood. Vortigern, the British ruler alleged to have invited the Saxons to Britain, is sometimes said to have owned land in nearby Builth Road on the Radnorshire side of the River Wye; the site previously having been known as Cwrt Llechrhyd. Early Post-Roman Builth was an independent kingdom. The most famous ruler was Elystan Glodrydd from whom many local gentry claimed descent. As an important component of Rhwng Gwy a Hafren, a political entity referred to in the poems of Taliesin, Builth was regularly at war with the Kingdom of Powys. Glodrydd probably lived at Llanafan Fawr rather than the modern site of Builth Wells. Until the foundation of the Norman town Llanfair ym Muallt the main settlement was Llanafan. Stories about Philip de Braose centre on Llanafan not modern Builth. 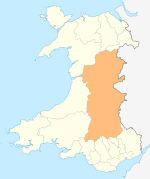 Ecclesiastically, the Deanery of Builth had always been part of St Davids and later Swansea and Brecon, rather than St Asaph. The site of the town controlled an important ford across the Wye, the crossing point of the main north-south route in Wales and an important south-west-east route. It was militarily and economically significant for centuries. The Welsh name for the town "Llanfair ym Muallt" refers to the foundation of a Norman church dedicated to St Mary. The churchyard is however, a truncated oval which is strongly suggestive of an original Celtic foundation. The town was laid out as two streets connecting a castle and a church and was protected by a hedge rather than a wall. This type of town is sometimes called a Bastide, a kind of medieval market settlement. In exchange for rights to live and trade in the market of the new town skilled townspeople paid the lord various dues. In many parts of Wales the skilled workers were of Flemish or English origin. However, Builth may have had important significance in Welsh language culture as The Mabinogion was long thought to have been recorded in its final form by medieval monks here and recent historical opinion has shifted to a view that it was written down by a lawyer in Builth. The only remains of the castle are huge earthworks. Builth Castle was built under King Edward I, the construction taking nearly five years in the 1270s. It replaced several earlier castles built by the Marcher Lord Baron Philip De Braose who claimed the area as a Marcher Lordship (Marcher Lords were substantially independent of the King of England and the Prince of Gwynedd). There may also have been an earlier castle at Caerberis (the fort of Peris) on the north side of the River Irfon near the original settlement. Owain Glyndŵr's forces attacked Builth Castle when it was in the charge of John Oldcastle during the rebellion of Owain Glyndŵr and it was repaired in 1409, the bill being £400. Llywelyn ap Gruffudd, Prince of Wales, came south from Gwynedd to the vicinity of Builth Castle in December 1282. There is evidence of treachery from the occupants of the castle and, while Llywelyn was separated from the main body of his forces,he was surprised by the Norman French and mortally wounded. A monument to Llywelyn at nearby Cilmeri, near to where he was killed, receives many visitors, especially on the anniversary of his death. In the centre of the town is a large mural (about 35 feet (11 m) by 30 feet (9.1 m) wide) depicting the final days of Llywelyn ap Gruffydd. The mural shows Llywelyn and his men in a scene depicting the fighting and a representation of Builth Castle, from which Llywelyn was turned away when trying to flee from the English. 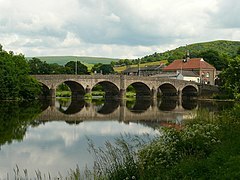 Builth Wells is in the Brecon and Radnorshire constituency for elections to the UK parliament and a constituency of the same name for elections to the Welsh Assembly. For elections to Powys County Council the town's boundaries are coterminous with the Builth electoral ward, which sends one county councillor to sit on the council. Since 1995 the ward had been represented by Independent councillors. At the May 2017 elections the seat was won by former international rugby player, Jeremy Pugh, after the previous councillor Avril York has resigned in December 2016 to move to Hong Kong. Twelve town councillors are elected every four years to serve on Builth Wells Town Council and represent the interests of the town's residents. The White Bull of Builth may be a reference to a herd of White Park Cattle that lived in the area from Post-Roman times. Two herds survived in Wales to modern times. The laws of the time suggest that the medieval and later economy of the Welsh borders was strongly dependent on cattle. The Hereford cattle breed, named after Hereford market where it was most prominently sold was the main breed of the Welsh borders. Builth was the market for a variant of the Hereford called the Builth Smokey Face. This was the traditional animal of the area but the breed has not existed for many, many decades. Ysgol Calon Cymru is the local bilingual secondary school, which replaced Builth Wells High School and opened in September 2018. In 2000 Builth Wells High School was placed 67th in Wales for its GCSE results (5 GCSEs, grades A-C) with a pass rate of 59%. According to the latest[when?] report by Estyn, however, it now has a pass rate of 77% and is the 9th best performing state secondary school in Wales. The high school is also the 2nd best performing state secondary school in Powys after Llanidloes High School. For comparison, 95% of pupils in Christ College Brecon gained five or more GCSEs in 2008. ^ "Town and ward population 2011". Retrieved 10 November 2015. ^ "What's in a name: Builth Wells". www.bbc.co.uk. BBC. 2013. Retrieved February 12, 2013. ^ Mills, A. D. (2003). "Builth Wells". Oxford Dictionary of British Place Names. Oxford University Press. ISBN 0191578479. Retrieved February 14, 2013. ^ "Powys County Council Election Results 1995-2012" (PDF). The Elections Centre. Retrieved 7 September 2018. ^ Twm Owen (5 May 2017). "Powys council election – the counting continues". Brecon & Radnor Express. Retrieved 5 October 2018. ^ Twm Owen (7 December 2016). "Councillor quits cabinet for Hong Kong". Brecon & Radnor Express. Retrieved 5 October 2018. ^ "Council Information". Builth Wells Town Council. Retrieved 7 September 2018. ^ "Llanelwedd Quarry, Builth Wells, Powys (Radnorshire), Wales, UK". Retrieved 23 September 2014. ^ "Builth Wells Quarry". Archived from the original on 23 September 2014. Retrieved 23 September 2014. ^ Builth & District Heritage Society. "Builth Wells Town Walk". builth-wells.co.uk. Retrieved 9 June 2013. ^ "Wyeside Arts Centre website". Retrieved 23 November 2016. ^ "Builth Male Voice Choir website". Retrieved 23 November 2016. ^ "Listed Buildings in Builth, Powys, Wales". British Listed Buildings. Retrieved 21 December 2014.